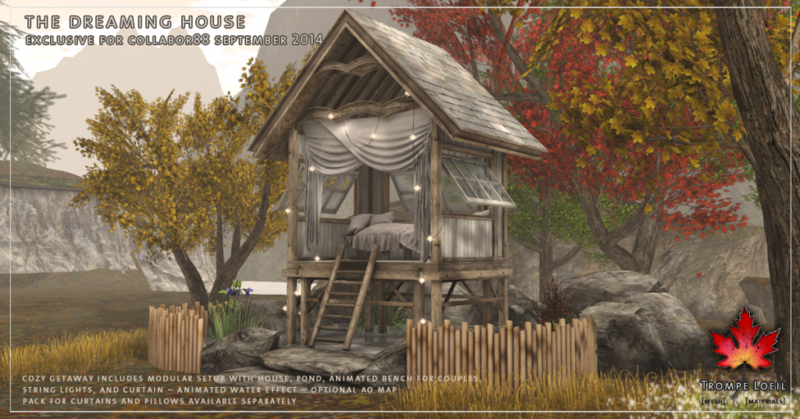 Unique spaces abound this September! 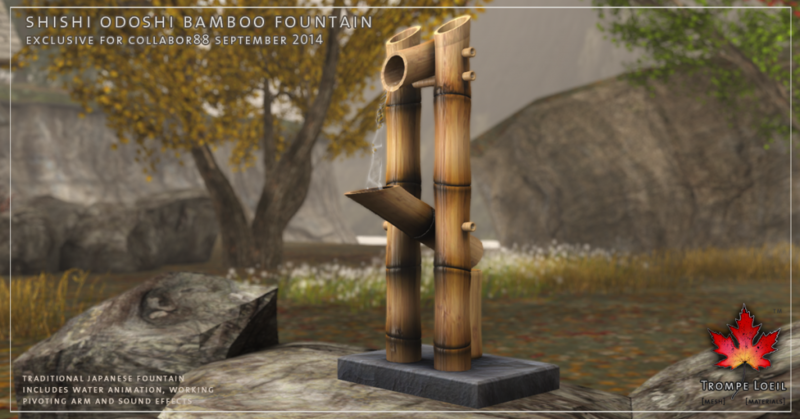 Immerse yourself in the changing colors of the season with The Dreaming House, create an auditory oasis with our Shishi Odoshi Bamboo Fountain, and relax in our stylish Monserrat Chairs – all at this month’s Collabor88! 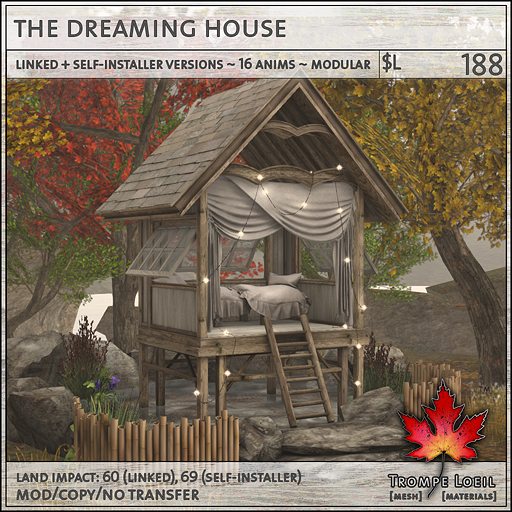 The Dreaming House includes a single-object linked version (59 LI) and a self-installer version with 5 linked pieces for easy modular use – house, bench, light string, curtains, and pond are all separate and easily removed if you wish. 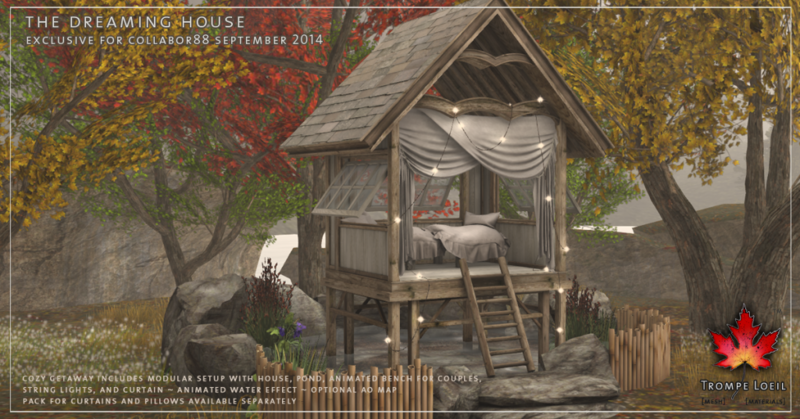 Makes a wonderful self-contained outdoor space for you and a friend, with both singles and couples PG animations, animated water effects, gentle lighting glow, and plenty of creative flexibility – at our special C88 sale price of $L188, plus the optional available AO Map Pack for the curtains and pillows, its easy to make it your very own! 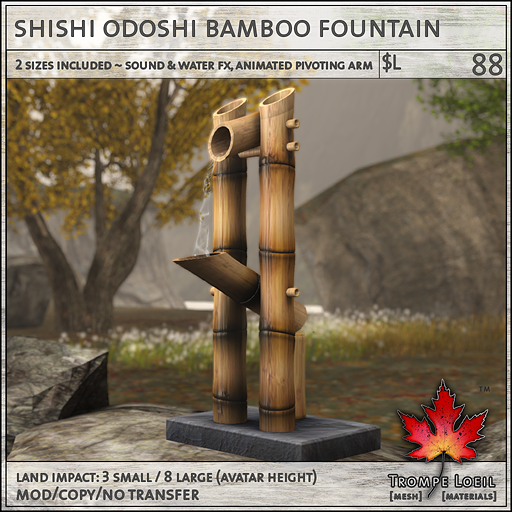 Our Shishi Odoshi Bamboo Fountain features custom water effects, moving bamboo arm that drops when it “fills” with water, and that familiar “bonk” sound and running water sound effects! Great for a patio or garden, just click the fountain to turn the sound and motion on and off. 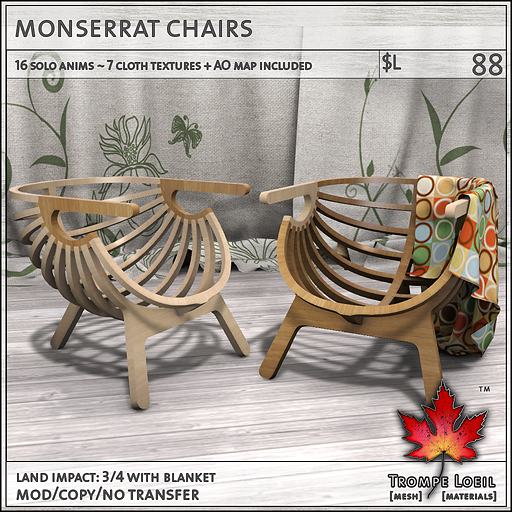 Finally at Collabor88, our Monserrat Chairs make a modern style statement, in the living room or on the patio. 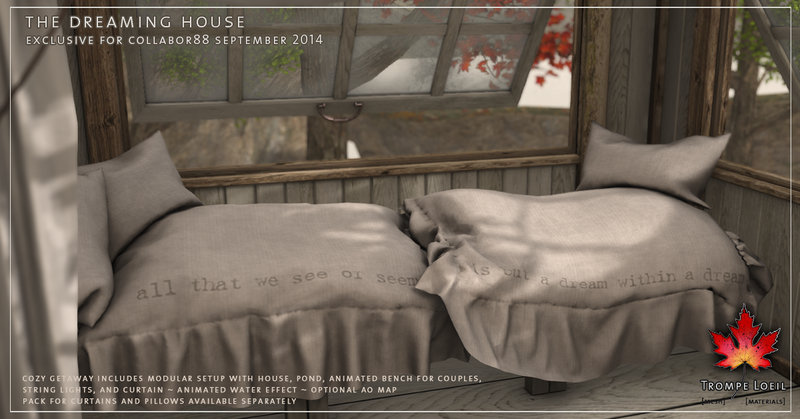 Includes two light/dark wood combinations, lots of solo PG animations, and both empty and throw blanket models with texture options and included blanket AO map! 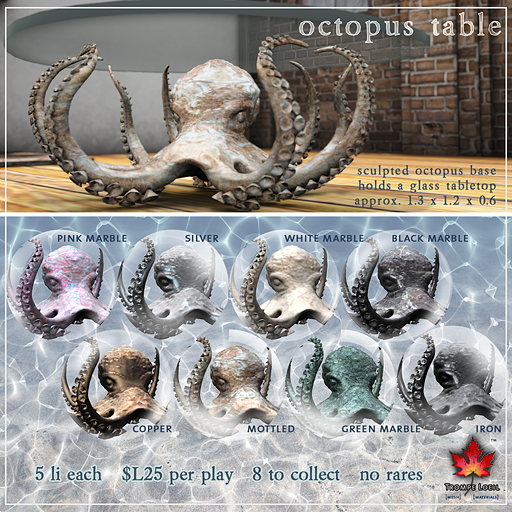 Until September 30th, you can grab your favorite finish of our new Octopus Tables for only $L25 per play! 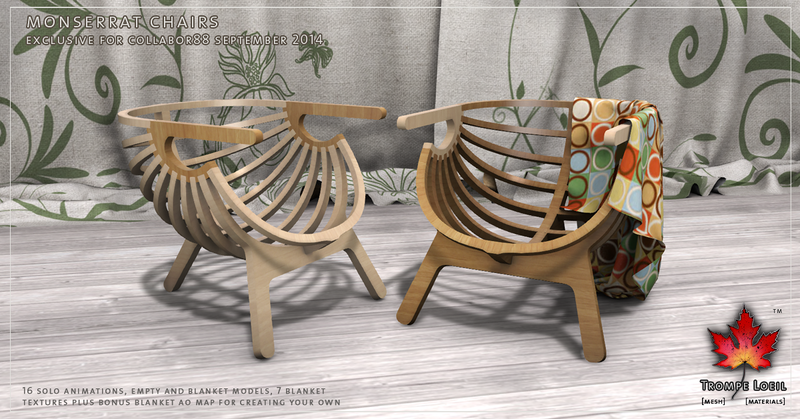 At 5 LI each they make a great conversation piece for any room. Collect all 8, only at The Arcade’s September round!